One of my veg plots is four squares with a cross shaped bark path separating them. I want to replace the path edging without using plastic and as cheaply as possible. 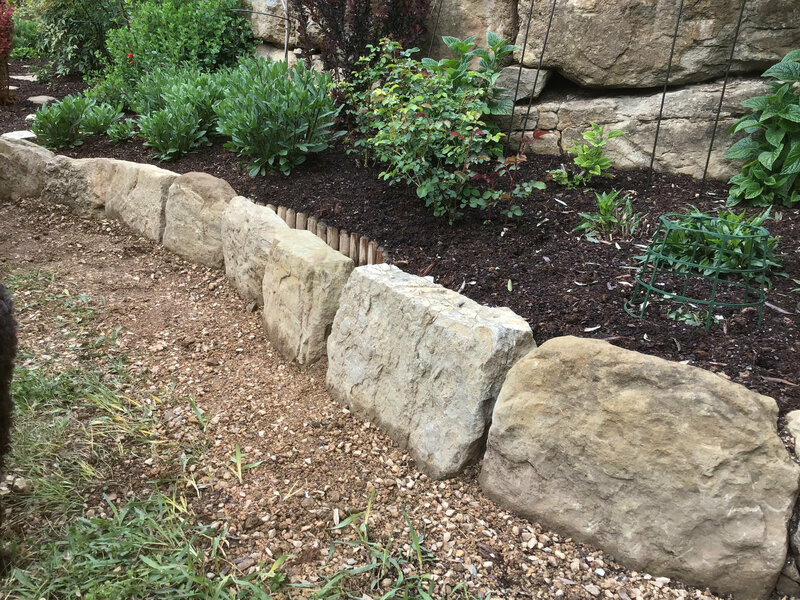 I have access to piles of quiet big stones (brick size+) so could use them but - my question is - is it a good idea to use stones or would I just be building homes for slugs. I've seen it done and it looks lovely but does anyone have any thoughts please? IMHO, you'd be creating masses of nooks and crannies not only for slugs, but for weeds to germinate , then be very tricky to remove. Hosta is dead right. I tried cobbles once. I gave up in the end and collected them all up. Thanks for your comments, I think you are both right so its plan B then! I find most edging is a slug and snail harbour and a b*gger to weed. I found that log roll stuff the worst, weed membrane inside didn’t work either, weeds just grew up between it and the roll. And it rotted and collapsed! The only thing I have found to be weed proof is railway sleepers but probably doesn't deal with the S&S issue. If the stones are rectangular and big enough, you could set them vertically, sunk into the ground by around a third into a weeded lined trench, mortar the joints and smooth them over on the inside edge with a fine portland cement to eliminate as many nooks and crannies as posible, keeping the visible edges rustic looking. This is my cunning plan anyway as I’m currently replacing the aforementioned log roll with stone.. If that is all you have to hand then I would just use them. They will be easy enough to lift up if you get the odd weed growing from under them. I would try to plant the most slug-irresistible crops next to the cross as you should get less slugs in that area - on the basis that they would have to walk up a bark path or across the whole plot to get to them! Thanks Nollie, I can see your idea would work with bricks but the stones I have available are irregular in size and shape so I don't think I could do it like that. But thanks for the very useful info - I'll use it elsewhere in the garden. If that is all you have to hand then I would just use them - on the basis that they would have to walk up a bark path or across the whole plot to get to them! Lol, thanks hogweed, your answer made me laugh as I imagined the slugs struggling over the bark path! As you say, stones are all I have and my Plan B is not much better so I'll give them a try, weeds shouldn't be too much of an issue as I can remove them before they establish and slugs will no doubt get at my crops anyway .... thank you, stones it is! Oh Ok, when you said brick-sized+ I imagined them as rectangular but no reason why they should be! Mine are fairly irregular too, but hefty enough to use horizontally in a fairly shallow trench. 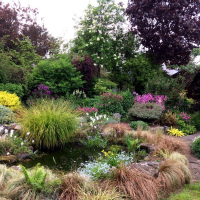 These are the better ones that I’m just bedding into gravel prior to mortaring etc., the really awkward ones are banished to the far end, Anyway, I'm sure yours will look lovely, show us a pic when your done! That looks gorgeous! Mine will be a pale imitation but yes I'll post a picture when its done. Thanks again for your help, much appreciated. Hi Midnightblue. Nooks and crannies aren’t just good for slugs, they provide a haven for all sorts of other wildlife as well. Some of it being beneficial. i have natural stone edging and paths all over my garden and my opinion is that if done properly the aesthetic value far outweighs any increased weeding or slug problems that come with it. It also lasts a very long time, if not forever, never looks dated and doesn’t look like what most other people have.